Beneath a shadowed moon in a cloud-streaked sky, the sacred orb splits and a hatching is born: It is Nyroc, son of Kludd, fallen leader of the Pure Ones, and his evil mate, Nyra. Born from evil, trained to evil, Nyroc is destined to fulfill his father's terrible plan, the oppression of all owldom under the vicious talons of the Pure Ones. But doubt grows in Nyroc's heart, fed by strange forbidden legends of a great tree far away where noble owls live in peace. And a light dawns in Nyroc's gizzard, nourished by friendship. A day is nearing when Nyroc must choose to fulfill his destiny-or defy it. It will be a day of blood and terror. 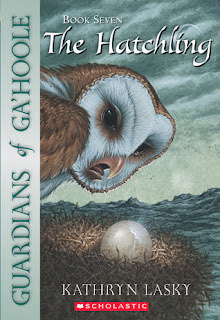 This is the seventh book in the Guardians of Ga'Hoole series, which I'm reading aloud to my younger daughter. This one is a bit different from the others in the rest of the series, because the focus is all on Nyroc and Nyra's plans for him. Until now, the major characters in the series have been Soren and his sidekicks who form the Chaw of Chaws. They are pretty much absent in this one, but we learn more about the Pure Ones and this one is a bit darker as a result. Part of the story was very sad, but I understand why it had to happen because it had a tremendous impact on Nyroc. For the last couple of books, I keep saying that this one is my new favourite. For me, the books have been getting better and better. Lasky took this one to the next level for me, which results in the higher rating. We are continuing on with the eighth book in the series, The Outcast.